Why should you do user experience at the highest corporate level? You should do it at every level in your organisation and everyone should own it. It is a damned good question. One that is in the hearts, minds, and wallets of many executives. The ever-increasing community of CI, CX, UX, UI, UCD, DE, etc. practioners are all scrambling to get their ideas included in discussions at increasingly higher stratas of companies. It is our newest incarnation of “the customer is always right” philosophy: new and improved, specially tailored to our rapid, demanding, technological, complex, and abstract world. After all it is harder to understand your customer when they aren’t coming in to have a chat at your shop like in the old days. Business is big and the public is savvy. The battle for what we want is getting tougher for both businesses and consumers. Business competition is rough and the world’s economic challenges aren’t making it any easier. Consumers are being bombarded by insane amounts of messaging all demanding behaviour changes and dollars from their hard-earned pay checks. Then why don’t we work together to create mutually beneficial situations? Like Apple, makers of what consumers want: an ecosystem that eliminates decisions regarding logistics and focuses all your decisions on content wrapped in an intuitive package. That is a very mutually beneficial situation and the sales say it all. Everyone’s interactions with each other, spaces, devices, and almost everything in our increasingly modern world is growing at astronomical rates (see any info-graphic representation of how much email, Facebook, Twitter, sms, YouTube activity has grown over the last 5 years, I can recommend dozens). You can’t just take your customer out of their highly connected information dense environment and study them in a lab. You also cannot just go around asking customers what they want all willy nilly. Too many risks are involved. Did you get the right people? Did you ask the right questions? Did you get insights from the customers that impact what you are trying to do? Too many people have to contribute too much time to research, create, and sell, for businesses to go firing shots in the dark, that costs a lot of money. We need structured approaches to tackle these problems and we need them to be proven in the field and in the battle for behaviour change. That approach exists and it has many names: CI, CX, UX, UI, UCD, DE, etc. 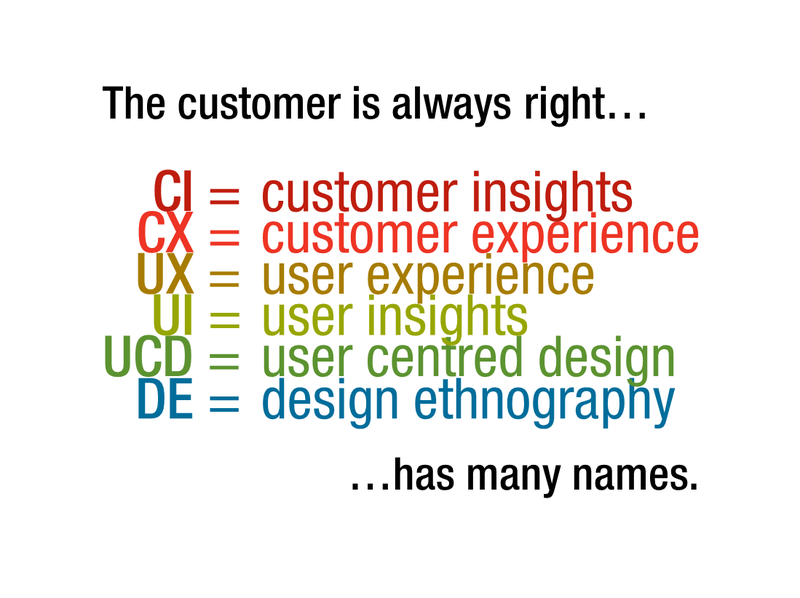 These are all the exact same thing, a user or customer centric approach to conducting business and creating new assets. Those folks at the top of bog organisations might look at all this and dig in their heels proclaiming, “Those are project or implementation level concerns, I do strategy… BIG strategy. We engage stakeholders just fine to drive that big strategy.” Thank you very much, come again. Well Madame or Sir Big Strategy I have some news for you. However you have been “engaging stakeholders” in the past is fine, but there are systematic and scientific ways to maximise your return on investment in engaging stakeholders. In other words, you are not getting your money’s worth, yet. You might do UX at the lower functional levels, but if incentives, key performance indicators, and overall management support does not align with a core UX philosophy then what is the point? The awesome UX will be a one-off affair or the change will revert as soon as you are done. Your money will be like a flash in the pan with no sustained effect. People involved will disengage and become quickly disenchanted with being customer centric if the impact is not evident and lasting. To counteract these risks UX must be embedded and supported throughout all levels of the business’s strategy and management. You and your customers are in the same boat and making your customer experience strategy the core of the decision-making process will get you both rowing in the same direction.